IntelliFront BI (Intelligence Frontier) represents a major leap forward in capability, ease-of-use, and cost efficiency for enterprises that have invested (or will invest) in a SQL Server®, Power BI®, Crystal Reports® & more for Business Intelligence. It will, in effect, supercharge Microsoft’s & SAP's offerings and deliver unprecedented value for streamlining the borderless enterprise. 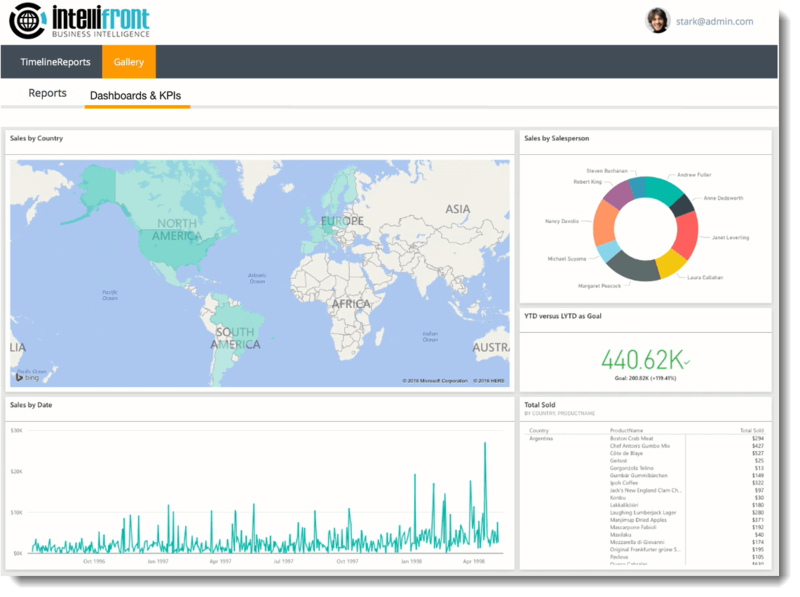 IntelliFront BI offers Real-Time KPI Dashboards, On-Demand Reporting, Data Driven Subscriptions, Business Process Automation and Report Scheduling on one platform. It caters for the full BI Continuum spectrum - the "push", the "pull" and everything in between. It is designed to enhance the capabilities of Microsoft®'s standard SQL Server SSRS and BI offering, and SAP's Crystal Reports solution at a fraction of the cost. The product emphasizes self-help facilities for serving SQL Server reports, Crystal Reports and dashboards while continuing to support centralized management and control over Business Intelligence assets. Advanced security features and a high availability architecture substantially mitigate corporate risk. IntelliFront BI™ doesn’t replace existing investments. Instead, it amplifies and extends the power of Crystal Reports, SQL Server reporting, Power BI & more at a much lower cost than equivalent Microsoft alternatives. Immediate cost savings and streamlined business processes mean the ROI payback period will be short. To ensure successful implementations, we have trained our professional services organization team to be terrific business consultants as well as outstanding certified technologists. We feel strongly that the value of IntelliFront BI can be appreciated only in a full business context that takes into account its many positive impacts beyond ROI and seeks innovative Business Intelligence solutions. Reliable delivery of business intelligence is great, but integrating that process with the rest of the enterprise is even better. ChristianSteven Software solutions have always supported threshold monitoring, process automation, workflows and embedded data update capabilities as natural product extensions. KPI Dashboards sit near the “pull” end of the BI Continuum. IntelliFront BI provides an operations-focused dashboard management system for companies that value a systemic approach to managing the enterprise and understand the importance real-time process monitoring and tracking KPIs. 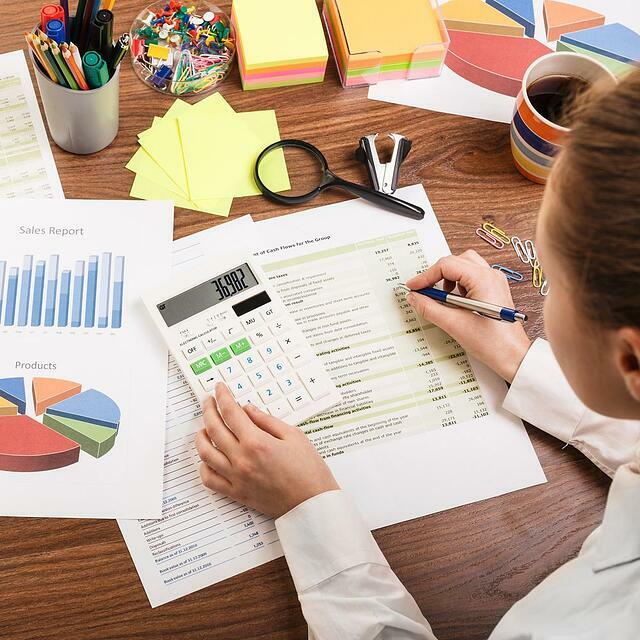 For some business users, conventional reporting isn’t enough. They want a real-time view of their world with easy-to-digest data visualizations that allow drill-downs to underlying details. Business users want up-to-the-moment views to be available on any platform, including mobile devices. Dashboard tools embedded in popular business applications are often too complex or require too much training. Business users don’t want to be involved with learning about the solution—they just want to use it to get the results they need. You simply don’t have resources to work on dashboards and incremental headcount is very difficult to justify. You want business users to be able to create and consume dashboards themselves. IntelliFront BI was designed explicitly for these needs. 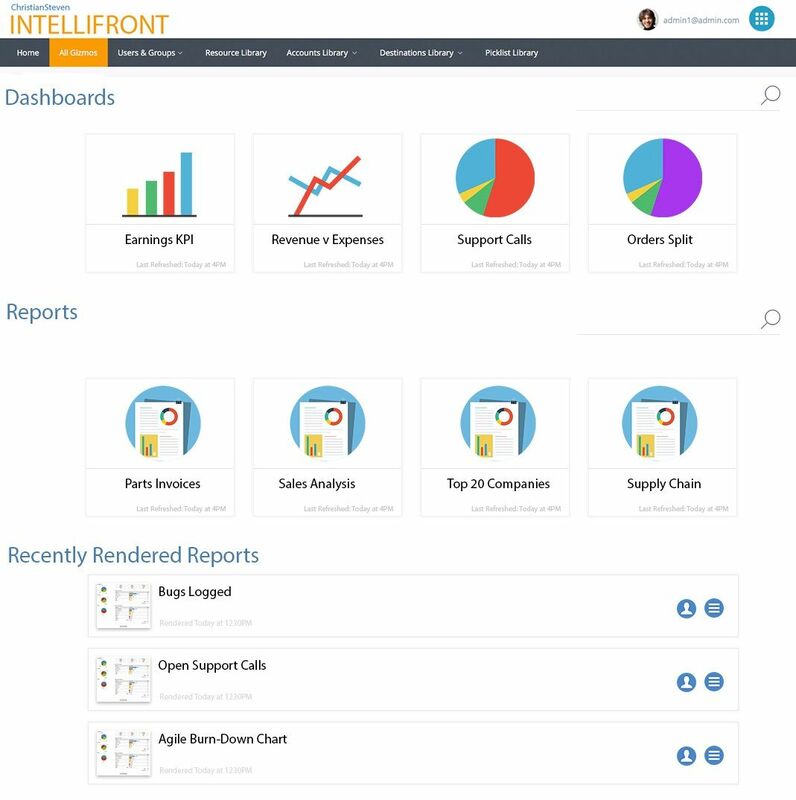 You specify the dashboards your organization needs, and IntelliFront BI delivers it. IntelliFront BI is a comprehensive dashboard deployment platform that also includes support for creating analytic applications, deploying reports, delivering managed self-service analytics and embedding analytics into applications and reporting software. Business Users can quickly create and deploy rich visualizations of your business, allowing you and your IT team to focus on your core competences. PBRS (Power BI Reports Scheduler) SQL-RD® (SQL Reports® Distribution) and CRD® (Crystal Reports® Distribution) are a set of best-of-breed platforms engineered to cover the "push" spectrum of corporate BI distribution needs. They provide delivery formats from sophisticated visualizations to raw data files. 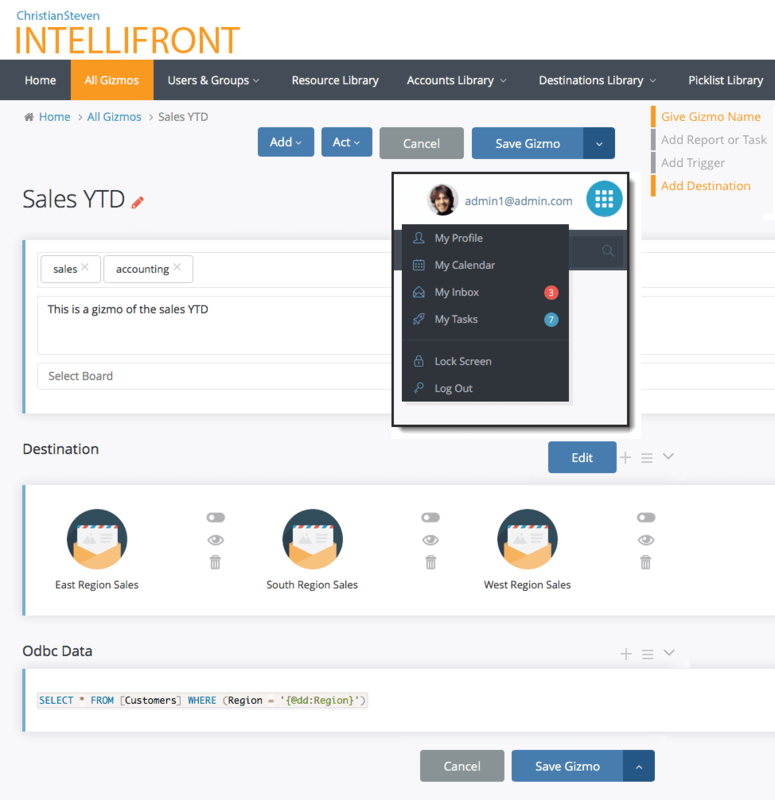 IntelliFront BI borrows from our existing technology, and over a decade of experience in report scheduling, workflows, and business process management to add an extra, but critical, dimension to a full-service Business Intelligence solutions suite. ChristianSteven Software recognizes that a typical enterprise has many types of business intelligence consumers, each with its own requirements and working styles. One size does not fit all, hence the need for a portfolio of solutions, each tailored to specific audiences along that spectrum. There is no central mechanism to manage and distribute reports generated by dozens or hundreds of discrete applications. IT analysts spend too much time outside of regular business hours triggering periodic reports, maintaining scripts or fixing batch files. Increasing demand for reports usually requires proportional headcount increases. IT organizations spend too much time at month-end or quarter-end fixing problems with application interfaces and process breakdowns caused by human errors. Companies often face challenges with managing piecemeal and isolated BI distribution solutions, many of which may be homegrown. Organizations that have defined—or intend to define—a single corporate business intelligence distribution strategy for employees, partners, and customers will find CRD & SQL-RD a perfect fit for that need. Automating SSRS reports is easy with SQL-RD. Easily batch up multiple Reporting Services Reports (even from different source servers), customize SQL Report formats, and manage business processes with workflows all in one tool. SQL-RD's advanced scheduling features include Dynamic report population, Data Driven Subscriptions, and Event Driven SSRS Reports. With SQL-RD, you can distribute SSRS reports to a variety of destinations, as well as customize the output file name without the need to upgrade to SQL Server® Enterprise. Augment your current SQL Reports distribution capabilities and take your existing SQL Server Reporting Services to a higher level. CRD, our Crystal Reports® Scheduler, is a dynamic, flexible, function-rich and intuitive Crystal Reports automation tool for scheduling, exporting, distributing and delivering your Crystal Reports outputs. Additionally, CRD contains Dynamic report population, Data Driven Reports, and Event Driven Crystal Reports as well as robust system, event and process automation functions which will make an instant impact on the efficiency of your business. The merging of Business Process Automation and mass Crystal Reports Distribution makes CRD unparalleled as a unified Business Management Solution. The PBRS, SQL-RD and CRD platforms are an extraordinary collection of robust capabilities woven together to optimize business report distribution in enterprises that have implemented Power BI, SSRS & Crystal Reports. The platform’s features are best understood through these functional categories. Scheduling Automation: PBRS, SQL-RD & CRD offer unparalleled flexibility to define fixed, dynamic, data-driven, bursting and event-driven schedules for individual reports or groups of reports. You can combine these dimensions to match your business requirements precisely. Because change is constant, the administrative interface facilitates easy alterations. 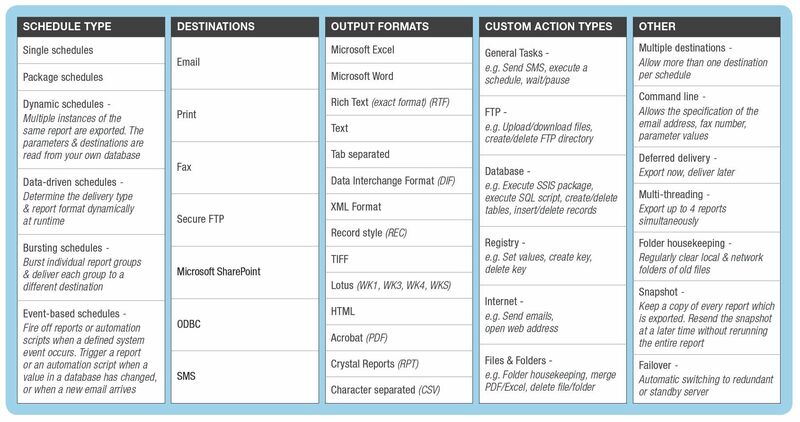 Report Destinations: Use any and all means to deliver reports: email, print, fax, FTP, SharePoint, Dropbox, Folder, ODBC, and SMS, to name a few. Destinations can be inside or outside the company. Output Formats: Choose from Acrobat (PDF), CSV, Microsoft Excel, Microsoft Word, TIF, RTF, RPT, DIF, TXT, HTML, DBF, XML and more. Watch Any Data Source or Application: Monitor anything—in any location—to trigger event- and threshold-driven reporting without human intervention. Limitless Action Types: Update databases, applications, files, directories; or trigger other actions based on pre-defined schedules or criteria. Security, Privacy, and Auditability: PBRS, SQL-RD & CRD meet all modern IT standards and are fully compliant with requirements defined by HIPAA, SOX, and conventions in the leading industries. Active Directory integration provides an extra, often missing, layer of protection. Central Administration. PBRS, SQL-RD & CRD are administered centrally from a single console, regardless of the number of destinations or where they are located. SQL-RD, in particular, allows you to manage centrally and distribute reports from multiple SSRS servers irrespective of physical location anywhere in the world, and PBRS lets you do the same for Power BI Reports & Dashboards. Keep your business moving ahead of competitors using our flexible and automated reporting software. Trusted worldwide by over 1000 companies including Nestlé, Cessna, FedEx, Capgemini and Adidas. It will revolutionize the way your critical information is distributed, getting the right data to the right people at the right time.